First it was Jeanmar Gomez, who was exiled to AAA Columbus after posting a 4-7 record with a 5.18 ERA. But things didn’t get any better. Then it was Josh Tomlin, moved to the bullpen along with his 5-8 record and 5.82 ERA. Next up was Derek Lowe, designated for assignment for an having an 8-10 record and 5.52 ERA. Now, after an 11-game losing streak – the second-longest in the Tribe’s 112-year history – where the starting pitchers were a combined 0-8 with a 10.44 ERA, the Indians have fired pitching coach Scott Radinsky. (Apparently Ubaldo Jimenez and his 8-11 record and 5.29 ERA is untouchable a year after the Indians mistakenly traded for him). It’s not like Radinsky was setting the world on fire, as the Indians starting rotation has the most losses (50) and walks (261) in the American League, the highest WHIP (1.51) and the 12th-worst ERA in the league (5.10). But with a starting rotation of No. 3 and No. 4 starters, is the pitching coach really the problem? 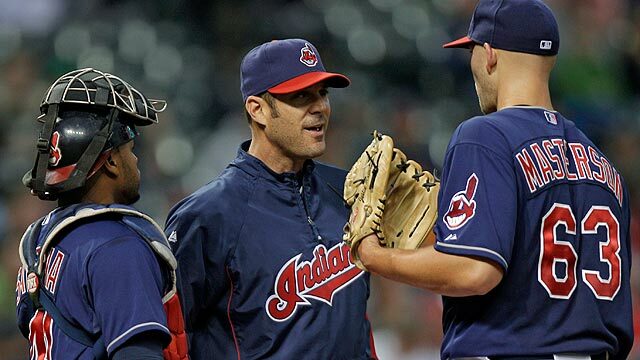 Radinsky will be replaced by Ruben Niebla who, according to the team’s website, is “one of the highest regarded pitching coaches in the Minor Leagues.” Niebla was an assistant on Manny Acta’s coaching staff in 2010, but has spent the majority of his coaching career working in the Tribe’s farm system. Oh, and the Tribe put designated hitter Travis Hafner on the disabled list with lower back inflammation. We probably should have made a macro for that when we started this site. This is Hafner’s second trip to the disabled list this season, having missed almost six weeks after undergoing right knee surgery in May. Hafner is hitting .239 with 11 home runs and 32 RBI. Utility infielder Jason Donald was recalled from Triple-A Columbus to take Hafner’s roster spot.